Fossil image from Darwin, C. R. ed. 1838. Fossil Mammalia Part 1 No. 1 of The zoology of the voyage of H.M.S. Beagle. 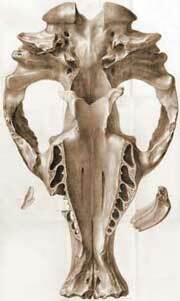 By Richard Owen. Edited and superintended by Charles Darwin. London: Smith Elder and Co. Courtesy of DarwinOnline. University of Cambridge. Used with permission. The largest collection of Darwin's writings ever published appears on the website The Complete Work of Charles Darwin Online (http://darwin-online.org.uk/) from 19 October 2006. Never before has so much Darwin material, and so many rare and widely dispersed items, been brought together in one place and made available free of charge. This site currently offers more than 50,000 pages of searchable text and 40,000 images of both publications and transcribed manuscripts. Most of the materials are available both as fully formatted electronic text and colour images of the originals. Darwin's works are also available as free machine-read audio mp3 files. The project, designed and directed by Dr John van Wyhe of Christ's College, Cambridge, is hosted by the Centre for Research in the Arts, Social Sciences, and Humanities at the University of Cambridge. The launch marks the end of the first year of the three-year's funding awarded by the Arts and Humanities Research Council. The website also includes the largest Darwin bibliography ever produced, based on the work of R. B. Freeman, and the largest catalogue of manuscripts (with over 30,000 entries) ever published. More than 150 supplementary documents are also provided, from secondary reference works to contemporary reviews, obituaries, published descriptions of Darwin's Beagle specimens and important related works for studying and understanding Darwin and his work. Each work containing illustrations or maps is provided with an overview page of thumbnail images allowing readers to see in seconds all the illustrations which are scattered throughout hundreds of pages. The thumbnails take readers directly to the larger version of the image in its context within the original work. Galapagos finches. Darwin, 1845. Journal of researches into the natural history and geology of the countries visited during the voyage of H.M.S. Beagle round the world, under the Command of Capt. Fitz Roy, R.N. 2d edition. Courtesy of DarwinOnline, Cambridge Universtiy. Used with permission. Most of the materials provided are appearing online for the first time such as the first edition of the Journal of Researches (1839) (or Voyage of the Beagle), The descent of Man (1871), The Zoology of the Voyage of H.M.S. 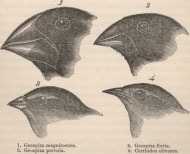 Beagle (1838-43) and the 2nd, 3rd, 4th and 5th editions of the Origin of species. There are also many newly transcribed and never before published manuscripts such as Darwin's Beagle field notebooks. One of these, the notebook in which Darwin recorded his immediate thoughts on the Galapagos, was stolen in the early 1980s and is still missing, but the text has been transcribed from microfilm. The many contributors and benefactors who have kindly helped to create this milestone in Darwin studies can be found on the website's acknowledgements. As vast as the collection now is, there is much still to come before 2009, the bicentenary of Darwin's birth and the 150th anniversary of the publication of the Origin of species. Forthcoming materials include further editions and translations, images of the majority of the Darwin Archive at University of Cambridge Library, more editorial introductions, notes, transcriptions and technical facilities for printing and larger images. New content is continually being added.